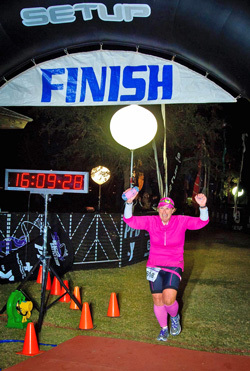 Cat Brewer, part-time faculty in communications at DVC and the San Ramon Campus for the past eight years, also is a competitor in Ironman triathlons. “I’ve been interested in triathlons for a while,” Brewer said, “ever since I first watched the Ironman Tri on NBC about 10 years ago. I completed my first Sprint distance TRI at the end of the 2009 season, and to date I have completed 15 of various distances.” These have included seven Sprint TRIs, five Olympic TRIs, two half-Ironman distance TRIs, and one full Iron-distance TRI. Triathlon events are swimming, biking and running, in that order. The Sprint is a half-mile swim, 12-mile bike ride and 3.1-mile run. The Olympic is a .9-mile swim, 25-mile bike ride, and 6.2-mile run. The half-Iron or 70.3 is a 1.2-mile swim, 56-mile bike ride and 13.1-mile run. The full Iron distance of 140.6 miles is a 2.4-mile swim, 112-mile bike ride, and 26.2-mile run, which must be completed in 17 hours or participants are disqualified. Brewer also participated in the California International Olympic distance TRI (Athena division), held at Shadow Cliffs Regional Park in Pleasanton with 332 competing. There were 16 divisions, broken down by age group. “There were 12 participants originally assigned to the Athena division (for participants weighing 150 pounds or more), but only three finished,” she said. Brewer took first place, finishing the Olympic distance course (.9-mile swim, 25-mile bike ride, and 6.2-mile run) in 3 hours, 49 minutes.